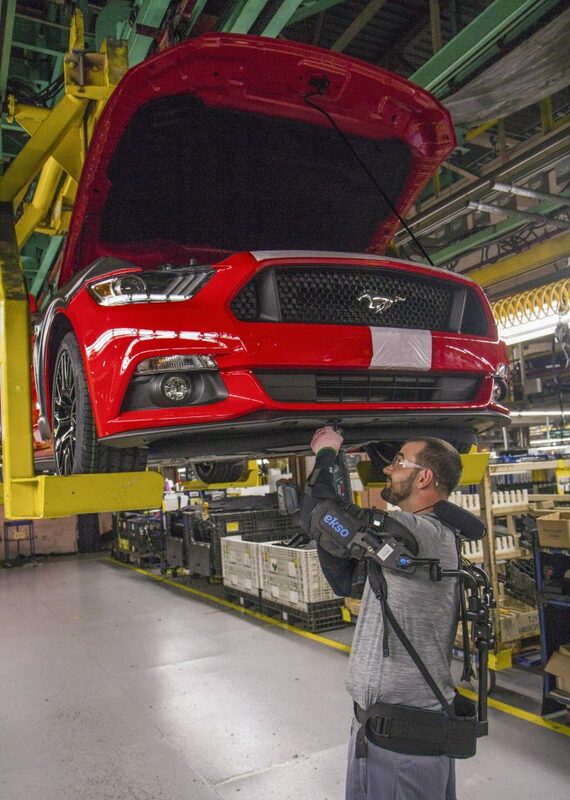 Ford Motor Co. in Dearborn today announced it is rolling out a new wearable technology globally called EksoVest that helps reduce injury risk in some plant workers after a successful trial in two U.S. plants. Ford employees in 15 plants and seven countries around the world are able to use an EksoVest to help lessen the physical toll that their job takes on their body. Ford partnered with Ekso Bionics to enhance the wearable technology that elevates and supports a worker’s arms while performing overhead tasks such as reaching up with a power tool to screw bolts to secure a brace while standing underneath the vehicle. The EksoVest fits workers ranging from 5 feet 2 inches tall to 6 feet 4 inches tall and provides lift assistance from five pounds to 15 pounds per arm. Ford workers say the equipment is comfortable because it’s lightweight and not bulky, allowing them to move their arms easily. Ford piloted the EksoVest at the Michigan Assembly Plant in Wayne and Flat Rock Assembly Plant in Flat Rock during the past year. The feedback from plant operators helped refine the technology before the company rolled it out globally. All of Ford’s North American assembly plants have EksoVests and they are being used in plants in Asia Pacific, Europe, and South America. For more information on the Ford and Ekso Bionics partnership, click here.